Theresa spent a long and lonely winter obsessing over her ex-boyfriend and everything that went wrong. However, she thinks she is finally ready to get back on the horse but feels utterly inept. Rather than mope and complain she signs up with a new speed-dating service that promises to introduce her to five compatible men in one night. As it turns out, she isn’t the only one with rusty dating skills. Tickets available in advance at Neptune Theatre or at the Plutonium Playhouse the day of the show. Forerunner Playwrights’ Theatre was formed in 2003 by a passionate group of emerging playwrights aspiring to increase presentation opportunities for new work in the Atlantic Provinces. We aim to present a diverse selection of plays as stand-alone premieres or ‘forerunners’ to further staging; generating an “Off-Broadway” style infrastructure for emerging and established playwrights from Atlantic Canada. Forerunner Playwrights’ Theatre permanently consists of Nate Crawford, Natasha MacLellan and Lisa Rose Snow. 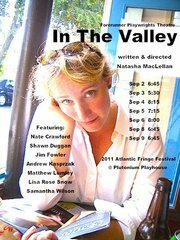 ‘In The Valley’ is our ninth world premiere.